To get to this page, go to Settings → Misc Settings → Proxy. 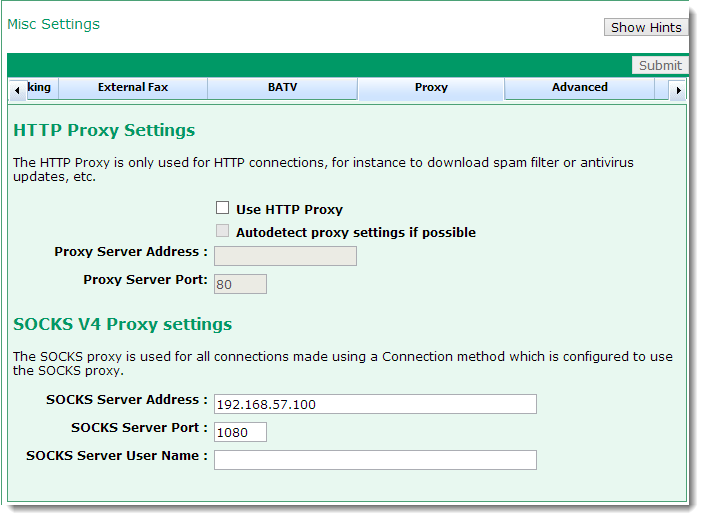 The Proxy settings let you configure proxy settings into VPOP3 so that it can make connections through an external proxy server. In most cases, these settings will be left blank. A HTTP proxy can only be used by VPOP3 to proxy HTTP connections - eg spamfilter updates, etc. Other connections, such as POP3 or SMTP connections can not be made through an HTTP proxy server. 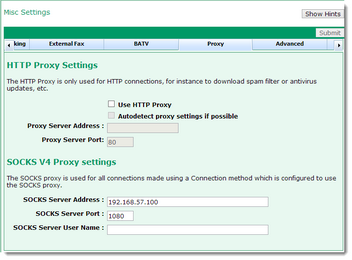 To tell VPOP3 to use an HTTP proxy, check the Use HTTP Proxy box. The Autodetect proxy settings if possible uses the Windows proxy detection system (the same as Internet Explorer, for instance) to attempt to detect the proxy settings automatically. If this doesn't work, or you want to use an alternative HTTP proxy, then you can specify the proxy server address (IP address or host name) and port number in the Proxy Server Address and Proxy Server Port boxes. There is no standard for the server port, but it is often set to 80, 8000 or 8080. Note: the Autodetect setting may not work if VPOP3 is running as a service. This is because the proxy detection in Windows is done on a per-user basis, and the VPOP3 service runs in a different user account from the current user. This means that it is going to be more reliable if you can manually specify the proxy server details. A SOCKS v4 proxy can be used by VPOP3 to proxy any type of connections, including POP3, SMTP, HTTP connections, etc. To tell VPOP3 to use a SOCKS proxy, you need to specify the SOCKS proxy address in the SOCKS Server Address box, and the proxy port in the SOCKS Server Port box. The standard port for SOCKS v4 connections is port 1080. SOCKS v4 authentication uses a 'user name' only (this may be a shared secret, rather than a potentially obvious username). This is optional. Contact the administrator of the SOCKS proxy server if you are unsure what to enter here. Note: SOCKS v5 is not compatible with SOCKS v4, so if you have a SOCKS v5 proxy server, VPOP3's SOCKS v4 support will not work with it.